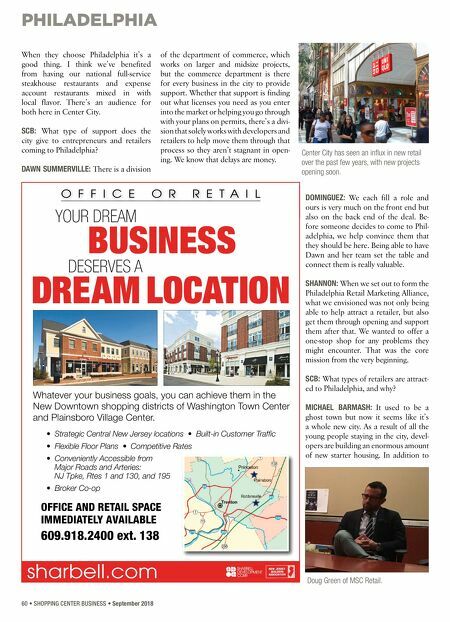 PHILADELPHIA 60 • SHOPPING CENTER BUSINESS • September 2018 When they choose Philadelphia it's a good thing. I think we've benefited from having our national full-service steakhouse restaurants and expense account restaurants mixed in with local flavor. There's an audience for both here in Center City. SCB: What type of support does the city give to entrepreneurs and retailers coming to Philadelphia? DAWN SUMMERVILLE: There is a division of the department of commerce, which works on larger and midsize projects, but the commerce department is there for every business in the city to provide support. Whether that support is finding out what licenses you need as you enter into the market or helping you go through with your plans on permits, there's a divi- sion that solely works with developers and retailers to help move them through that process so they aren't stagnant in open- ing. We know that delays are money. DOMINGUEZ: We each fill a role and ours is very much on the front end but also on the back end of the deal. Be- fore someone decides to come to Phil- adelphia, we help convince them that they should be here. Being able to have Dawn and her team set the table and connect them is really valuable. SHANNON: When we set out to form the Philadelphia Retail Marketing Alliance, what we envisioned was not only being able to help attract a retailer, but also get them through opening and support them after that. We wanted to offer a one-stop shop for any problems they might encounter. That was the core mission from the very beginning. SCB: What types of retailers are attract- ed to Philadelphia, and why? MICHAEL BARMASH: It used to be a ghost town but now it seems like it's a whole new city. As a result of all the young people staying in the city, devel- opers are building an enormous amount of new starter housing. In addition to Doug Green of MSC Retail. O f f i c e O r r e t a i l Whatever your business goals, you can achieve them in the New Downtown shopping districts of Washington Town Center and Plainsboro Village Center. 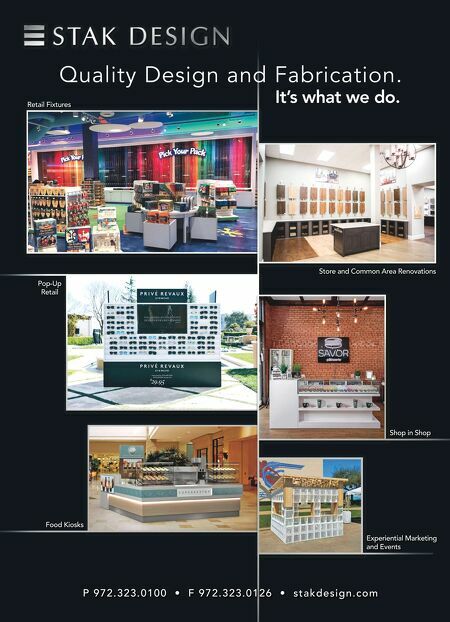 • Strategic Central New Jersey locations • Built-in Customer Traffic • Flexible Floor Plans • Competitive Rates • Conveniently Accessible from Major Roads and Arteries: NJ Tpke, Rtes 1 and 130, and 195 • Broker Co-op OFFICE AND RETAIL SPACE IMMEDIATELY AVAILABLE 609.918.2400 ext. 1 38 Your dream BUSINESS deserves a DREAM LOCATION sharbell.com Center City has seen an influx in new retail over the past few years, with new projects opening soon.